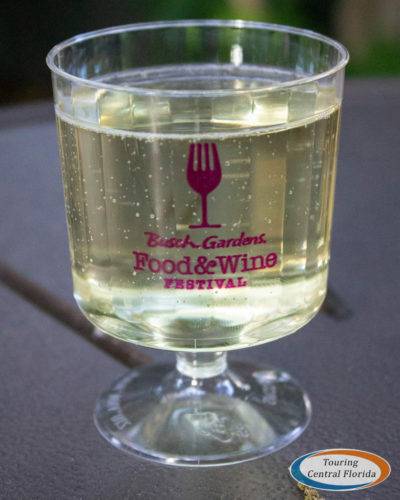 The 5th Annual Busch Gardens Tampa Bay Food & Wine Festival has begun, bringing great food, drinks, and live entertainment to the park for 7 weekends in March and April, from noon to park close on event days. As always, access to the festival area and general seating for the headline concerts is included with any valid admission (Bronze Annual Pass and Fun Cards do have blockout dates – see below for details). Below is our complete guide to this year’s event, including links to more detailed guides with menus and pricing for all of the food and drink cabins! While we’ve attempted to provide the most accurate information possible, all of the details, pricing and item availability are subject to change without notice. Last update: 4/5/2019. 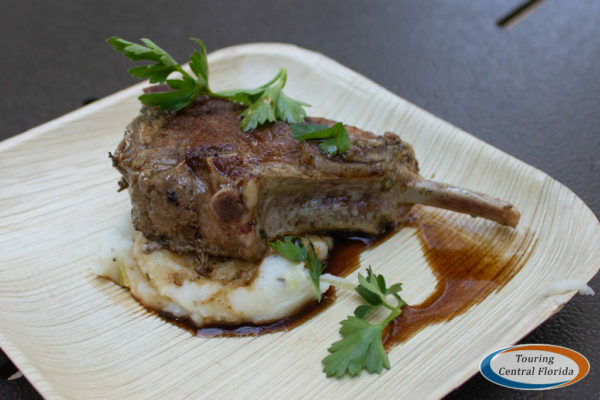 There is a whole lot new with the Busch Gardens Tampa Bay 2019 Food & Wine Festival. In fact, this year’s event features the largest menu change in its history, with only a few returning dishes. Just four fan favorites made the cut, with an additional 35 items being new this season (although a few of those definitely have their roots in previous dishes). 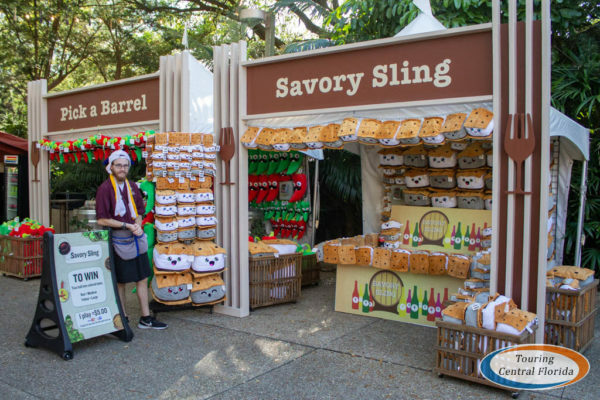 Those food items spread across 13 booths have a new theme this year, with names representing different American regions from Northern California to New England. The dishes at each are meant to be representative of the unique culinary traits of their namesake region. 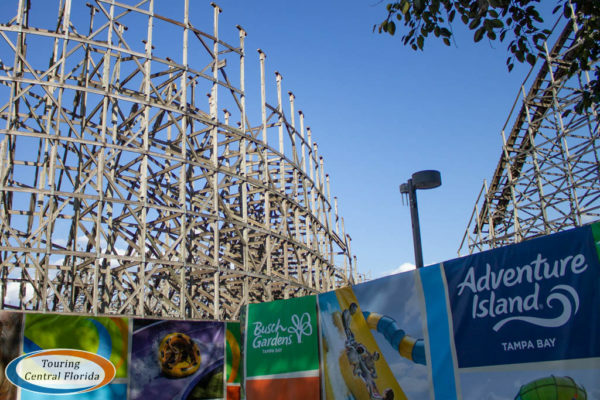 The layout of the festival is also a bit different this year, as work continues on the demolition of much of the Gwazi structure. 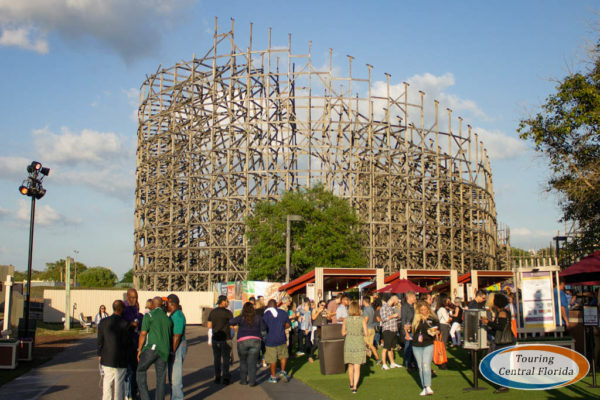 See more about Gwazi in our recent articles. Part of the main festival walkway is walled off while work goes on there, and an expanded pass through was created in the former Eagle Canyon area to provide access to the concert field. 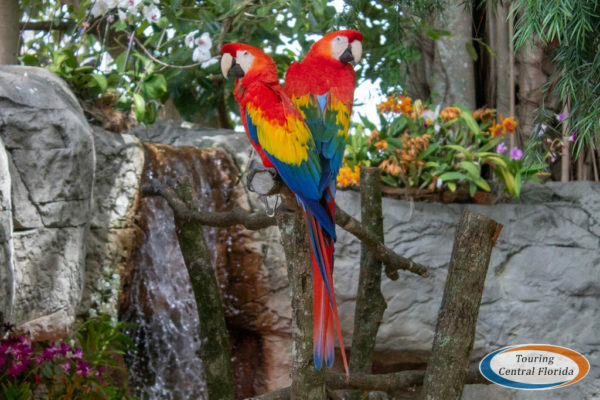 Keep an eye out for some macaws on display in this area when you head through. 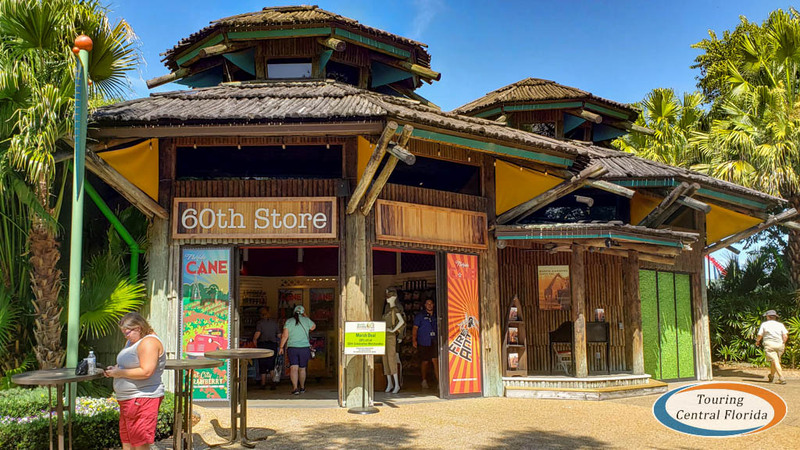 On the far side of Garden Gate Cafe, look for the special 60th Celebration Store, open on weekends during the festival. 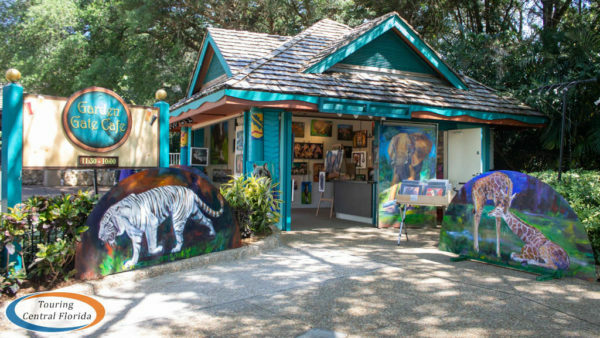 The pop up shop celebrates the park’s history with various 60th Celebration merchandise and an assortment of new pins as part of the Pin Trading program that kicked off earlier this month. Out on the porch, keep your eye out for author Joshua McMorrow-Hernandez, who wrote a book detailing the park’s history. On select days, he’ll be there to sign books and is always happy to discuss the park’s past with fans. 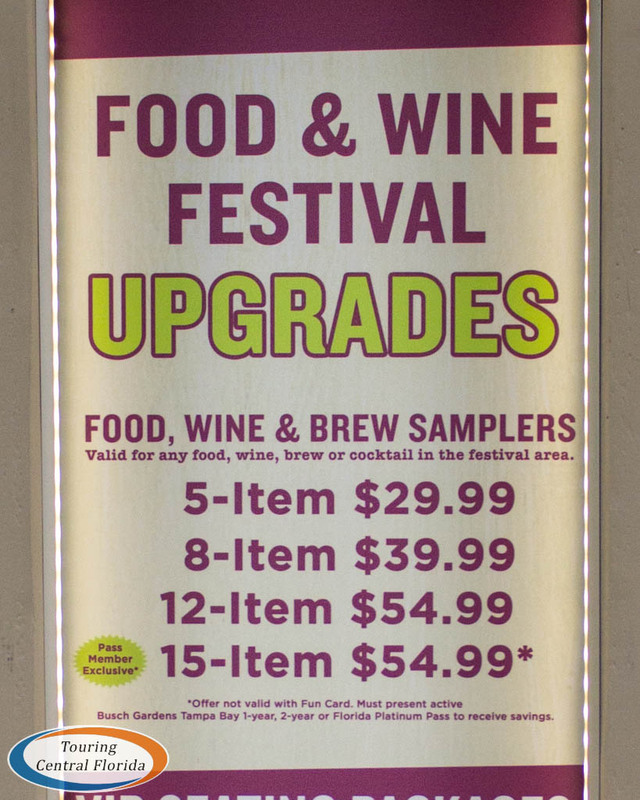 One additional change at this year’s Food & Wine Festival that will impact some visitors – select event dates are blocked out for guests with the new Bronze Annual Passes or Fun Cards. The block out dates for those admission types through the end of April are: March 30, April 6 & April 13-27. 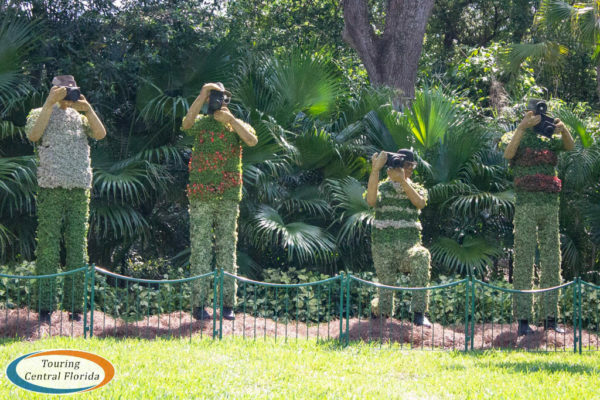 On those dates, Bronze Annual Pass Members and Fun Card holders can purchase a one day admission into the park for $25. It’s important to note there are no block out dates for Silver, Gold or Platinum Annual Pass Members. 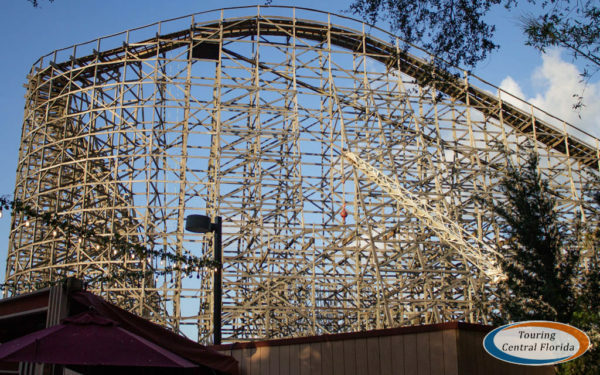 As a reminder, if you purchased your annual pass prior to October 4, 2018 & haven’t made any changes to your account, you fall under the Silver level in terms of benefits. A total of nearly 40 culinary creations across 13 cabins are on this year’s menu, including nearly three dozen brand new dishes. Prices for items range from $5 to $7, with some of the samples large enough to share between two people for a light snack. You can pay out of pocket (pass member discounts apply) or use your sampler lanyard at the cabins. Returning favorites like duck fat truffle fries and the griddled cheesecake sandwich meet new items like a lobster roll and Kona filet. 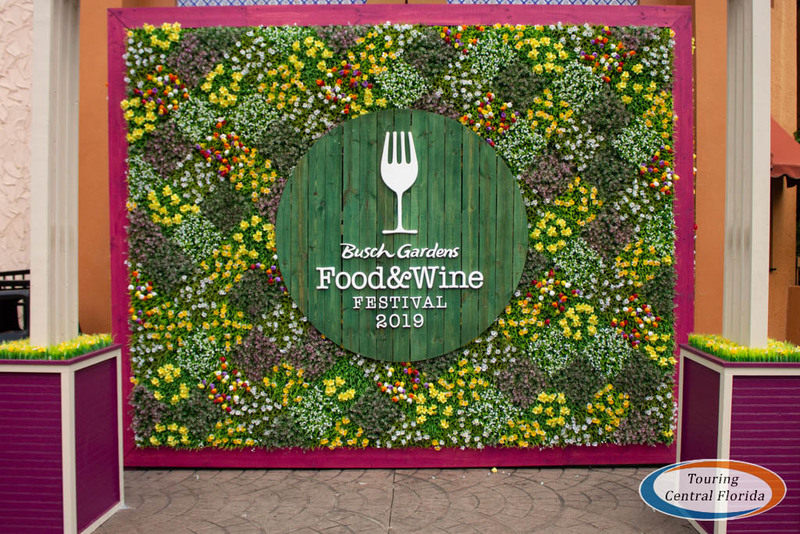 See more, including a full listing of menus and pricing, in our Busch Gardens Tampa 2019 Food & Wine Festival – Food Guide! 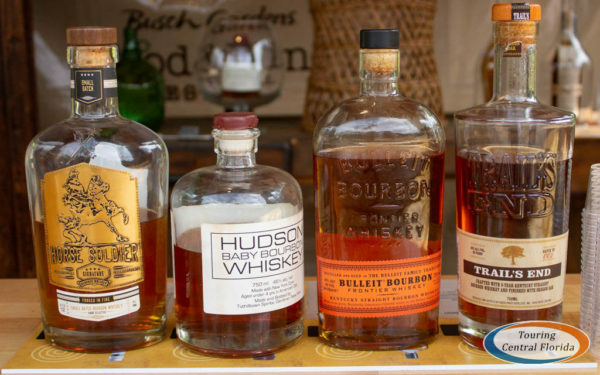 Way more than just wine, the festival also features a number of craft beers and ciders, a few frozen cocktails, and even special wine, bourbon and tequila tasting bars! 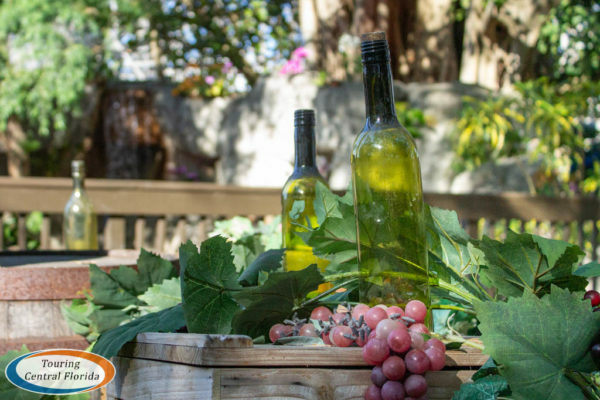 There are more than a dozen cabins featuring over 100 wines, craft beers and cocktails, plus several of the 13 food cabins also feature a wine, beer or a cocktail that pair with the dishes they serve. You’ll also find a standard domestic and foreign beer selection, bottled sodas, and water at a number of the food cabins. Pricing is standardized across the booths – at the cabins you’ll find wine and cocktails available for $8.50 a glass, and the craft beers at $8.99 a glass. Most of the food cabins also offer bottled beverages: domestic and foreign beers will run you $7.99 to $8.99; Coca-Cola products are $3.89, and Dasani is $3.49. Glaceau Smartwater is also available for $4.49. 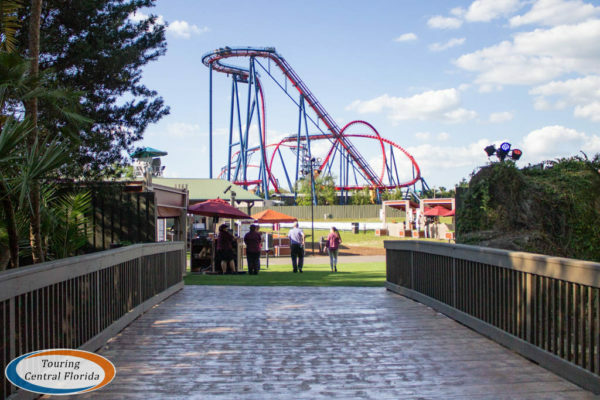 Like the food cabins, you can pay out of pocket (pass members discounts apply) or use your sampler lanyard. Guests 21+ can also partake in special tasting experiences, learning about the different beverages while trying something new. 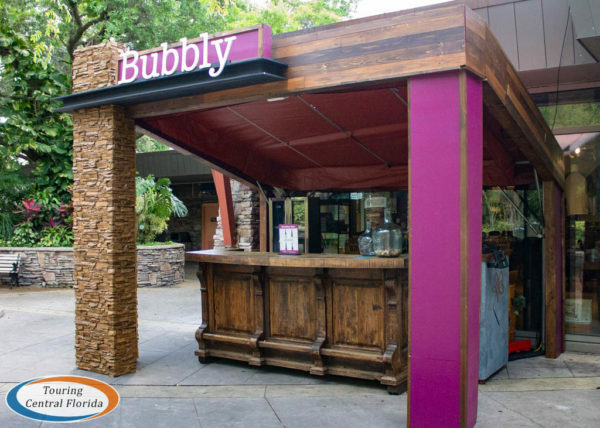 This year, guests can choose from sparkling or ice wines, bourbon, tequila, or infused vodka. Tastings are $27.99 each, or available as a combo package that provide some savings. 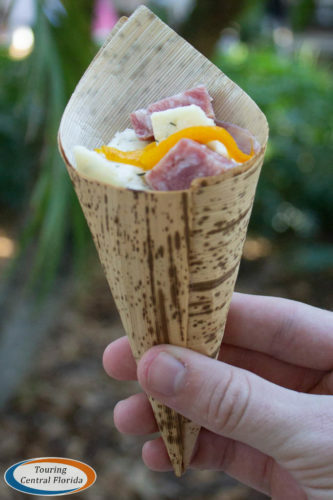 See more, including a full listing of menus, in our Busch Gardens Tampa 2019 Food & Wine Festival – Drink Guide! Available for purchase at the Welcome Center or at any of the festival cabins, the Sampler Lanyards can save you money if you’re planning on purchasing multiple items. The best part is the lanyards can be shared among your party, and are good throughout the duration of the festival, so no need to buy one for every person or feel you need to use all the punches in one visit. There are three price points for the lanyards – $29.99 for a five-item lanyard, $39.99 for an eight-item lanyard, and $54.99 for a 12-item lanyard. Annual pass members can also get a special 15-item lanyard for the price of a 12-item lanyard (no further discount applies). The pass member discount does apply to the 5 and 8-item lanyards. 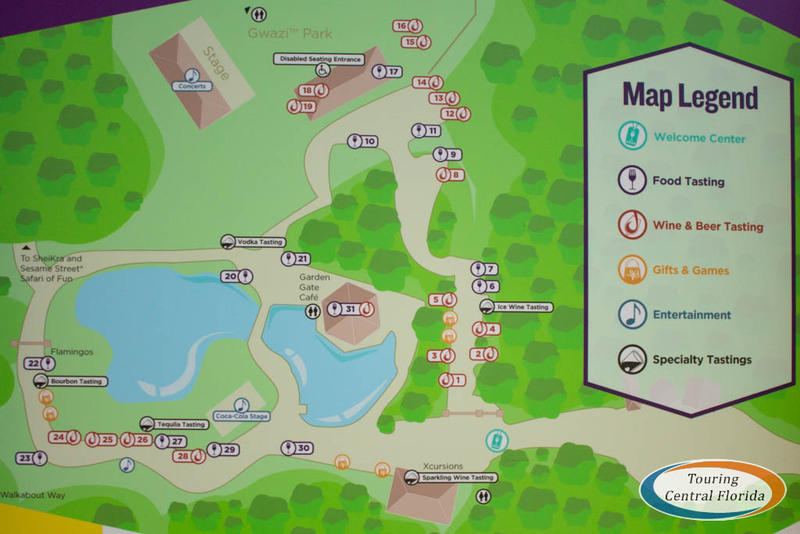 The lanyards are valid at every booth for every food and alcoholic beverage item, and the sizes for the food or beverage items are the same whether using a punch on the lanyard or paying out of pocket. How much you can save will vary depending on which lanyard you purchase and what items you choose, but assuming you get a 12-item lanyard and stick to the most expensive food and beverage items, you can easily save over $30 compared to the full price menu items. Headliner concerts this season span the decades and genres, meaning a wide variety of choices whatever your particular musical interests may be. From 3 Doors Down and Foreigner to El Gran Combo and Mighty Mighty Bosstones, you’re bound to find a few concerts you won’t want to miss. VIP Seating packages return, starting at $34.99 depending on the date and demand for the artist. Each VIP Seating option comes with a 5-item sampler lanyard, a $29.99 value. The VIP seating is limited, and online purchase in advance is recommended. However, if VIP Seating is still available on the day of the concert, it can be purchased at the Festival Welcome Center or at the VIP Upgrade booth located next to The Heartland, booth #10 on Gwazi Field. 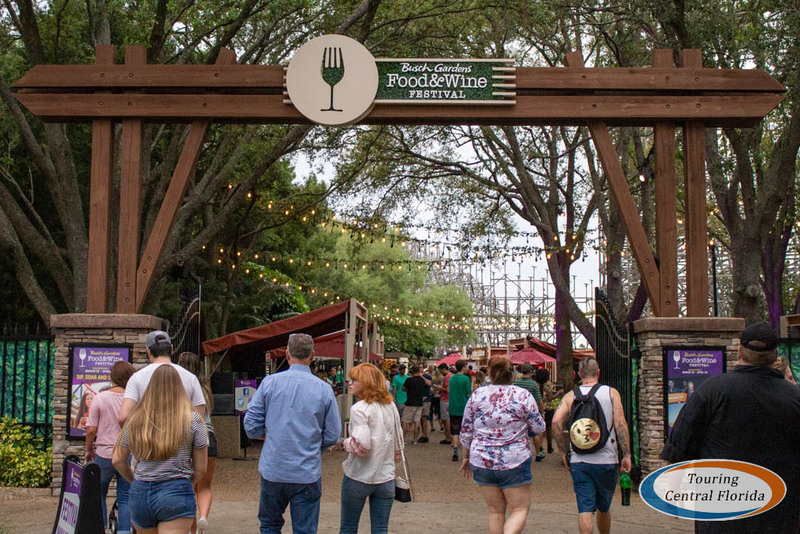 See the complete lineup, start times and full VIP Seating package details in our Busch Gardens Tampa Bay 2019 Food & Wine Festival – Concert Guide. 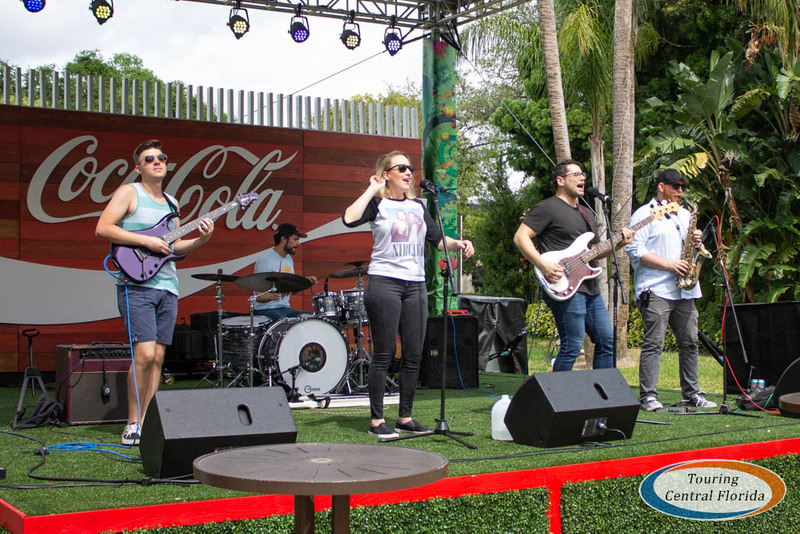 Returning this year is the Coca-Cola Stage, located on the corner opposite the small lake outside of Garden Gate Cafe. Featuring local bands each weekend, look for performances several times each day. On the first weekend, Mighty Mongo Band performed. 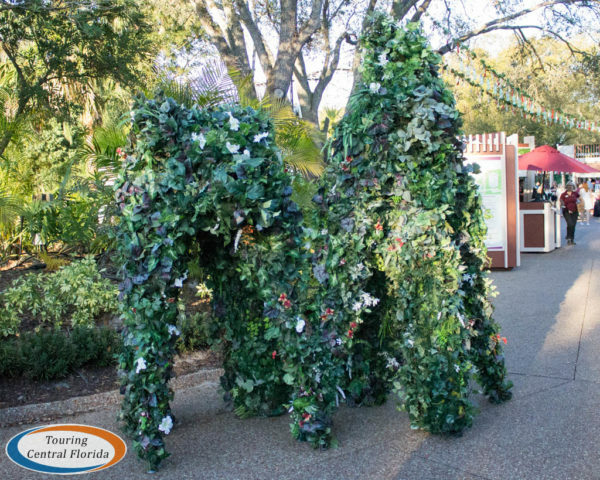 Other area entertainment includes returning guest favorites like the Living Topiary and Living Fountain. 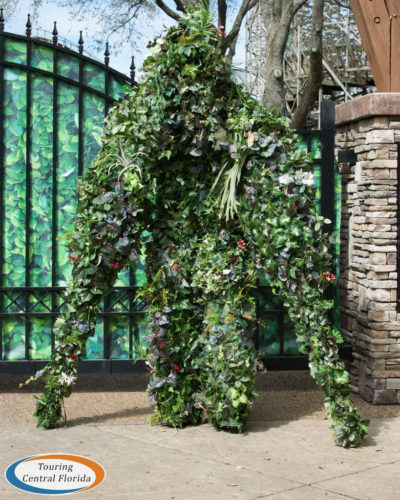 Find the Living Topiary at the Gwazi Park entrance beginning around noon. 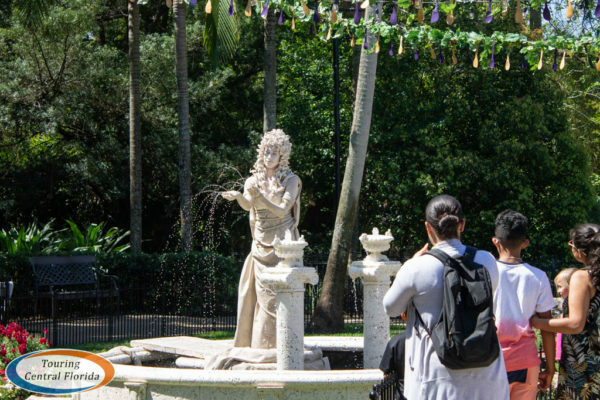 The Living Fountain can be seen several times each afternoon in the small courtyard garden near the kangaroo habitat. 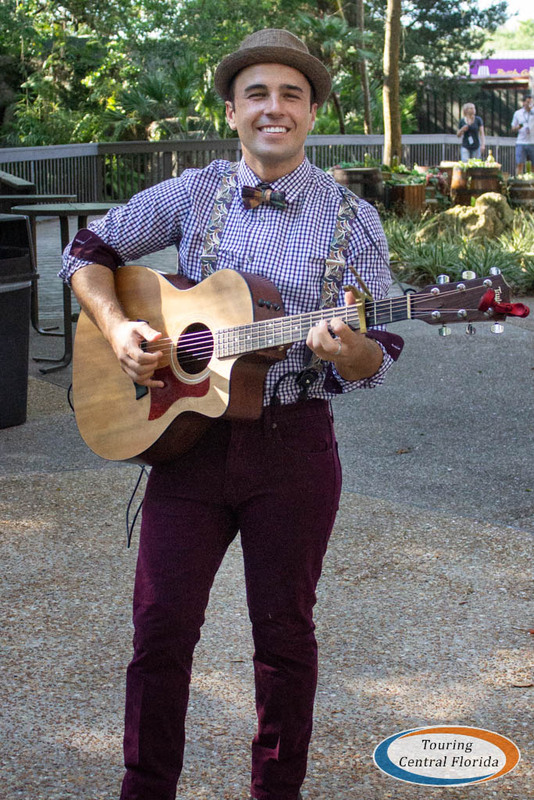 Keep an eye out for strolling entertainment, like this guitarist along the main festival walkway. 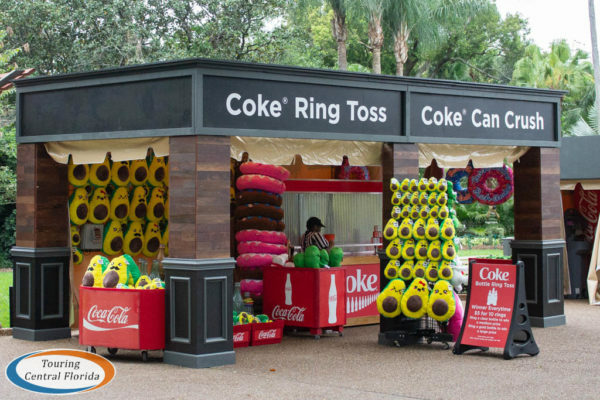 Mixed in with the food and drink cabins along pathways, you’ll find a variety of shopping and games. 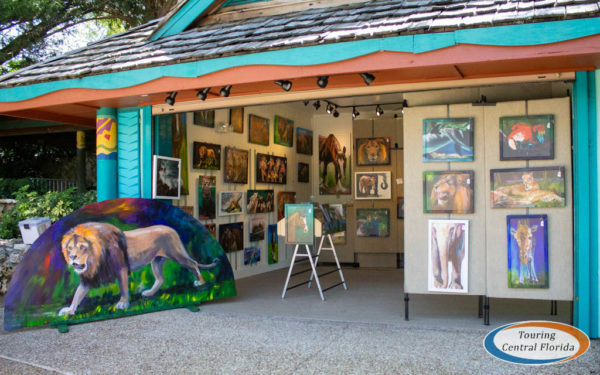 Local artisans include painter Ann Dalton, who has a booth set up just outside of Garden Gate Cafe. 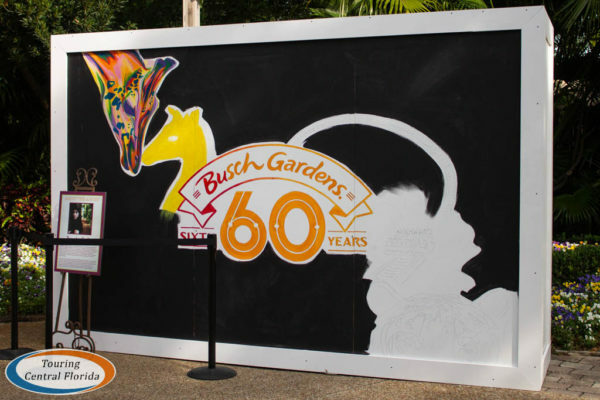 Returning again this year, local artists will be featured creating murals each week around the festival grounds. 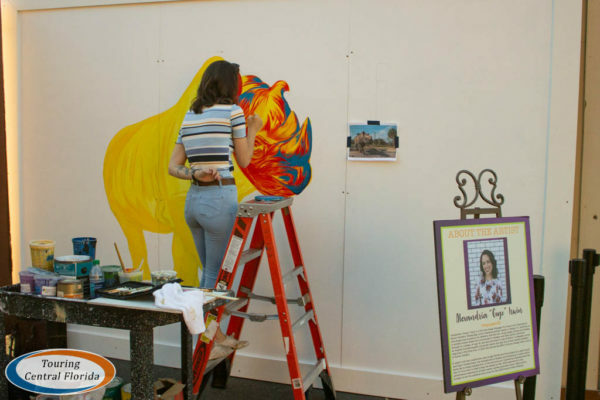 This past weekend, Alexandria Gogolin was busy creating different murals. Right from the park’s entrance, Food & Wine theming is abound. Look for a large photo op wall just inside the gate. 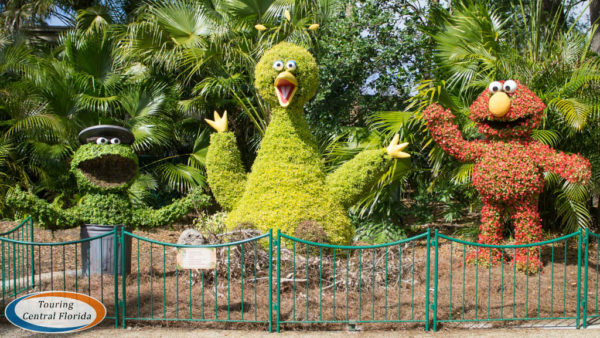 Look for a few topiaries added to the small field across from Garden Gate Cafe. 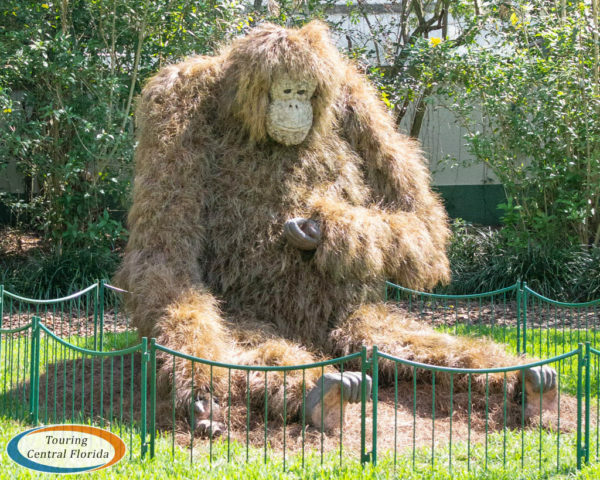 There, an orangutan and the “toparazzi” join year-round displays like the Sesame Street gang along the walkway near the flamingo habitat. Plan to arrive early. 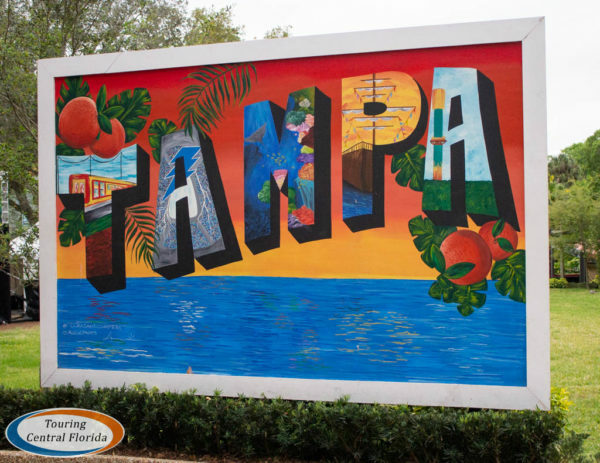 With headlining acts and Spring Break season, Food & Wine weekends can be quite busy. Your best bet to beat the crowds is to arrive early (parking lot opens 30 minutes or so before the park does). Arriving between 11 and 3 could mean you’ll have very long waits to park, for the tram, and to get through security at the gate. Hit your must haves early. 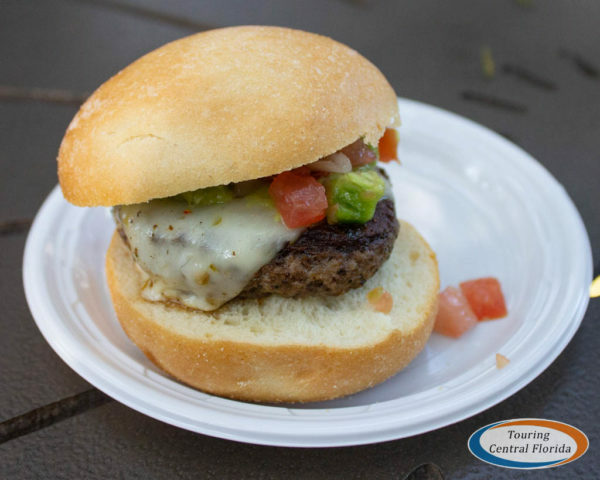 If there is a food or beverage item you know you have to try, make sure to visit those cabins earlier in the day – for two reasons. First, crowds generally aren’t as big in the early afternoon, so you’ll wait less in line. And second, since items are made fresh each day, it’s not uncommon for some things to run out towards the end of the day, especially after the concert lets out.